I'm in BIG twuble...My hubby is going to be unhappy with me. A couple of days ago, part of a back molar chipped off. For the last several years the dentist has prepared me for the sure event that it would break and it will need to be crowned. The reason why I am in BIG twuble...Russ told me to call my dentist on Sunday. I told him I would do it Monday. I didn't. This morning he told me to call my dentist today and he proceeded to lecture me. I told him I would...But....I didn't. Partly because I am stubborn and don't like to be told to do something. 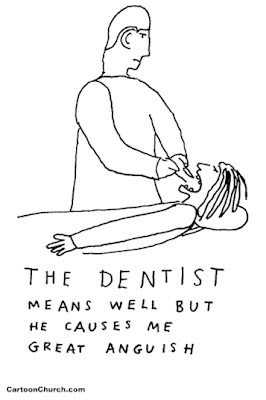 And partly because I really, really don't want to go to the dentist. Makes no sense. Its not rational. It is my reality though. I can relate too ... I don't like dentists (or doctors) either. I had a root canal and crown on a tooth a couple of years ago. Just yuck, both the cost and the time involved (dentistry has improved a lot, and honestly it wasn't painful). Just do it - you will feel a lot better, and you'll be so happy it's DONE! Keep us posted. I'll pray for you today! I hate going to the doctor but I like my dentist so much that I actually look forward to those visits - except for the bill!! I have anxiety going to the regular doctor (I'm worried she'll tell me something bad). I have a FEAR of the dentist!